NORFOLK, VA - Michael Doherty score the game-winning goal while Cole Kohler made 24 saves to lead the Manchester Monarchs past the Norfolk Admirals Saturday Night at Scope. Taylor Cammarata and Luke Nogard both notch their eighth goals of the year and extend their point streaks, Despite the loss, Norfolk remains in third place in the South Division with a record of (12-10-1-1 26 Points). Manchester got on the board first just 1:14 into the opening period with a goal from Matt Marcinew. Zeb Knutson played the puck from along the right wall behind the net to Travis Walsh. Walsh fed the puck to Marcinew right in front of the net, and his shot beat Reichenbach over the glove to give Manchester a 1-0 lead. 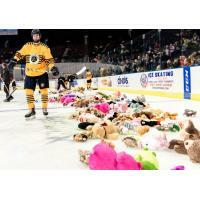 Norfolk answered with a goal from Luke Nogard that summoned the stuffed animals to be thrown onto the ice for the Teddy Bear Toss (pictured below). Patrick D'Amico shot the puck from the point which caused a scrum in front of the net. Ben Duffy found the puck and pushed it across the crease to Luke Nogard. Nogard, waiting on the back post, jammed at the puck and was able to push the puck past Cole Kehler to tie the game at one. Manchester regained the lead with a goal from David Kolomatis. Joe Pendenza skated into the Norfolk zone with possession of the puck. Pendenza fired a cross-ice pass to Kolomatis who's shot from the right circle went over the glove of Reichenbach to give Manchester the 2-1 lead. The Admirals would tie the game on a goal from Manny Gialedakis. John Gustafsson gathered the puck along the half wall after a scrum in the right corner. Gustafsson played the puck to Jacob Graves at the left point. Graves unloaded a blast which was tipped on the way to the net by Gialedakis to tie game at 2. The goal was first professional goal for Gialedakis. Norfolk took the lead courtesy of a goal from Taylor Cammarata. Darik Angeli skated into the Manchester end after a turnover in the neutral zone. Angeli fed a cross ice pass to Cammarata who skated through the left circle, went from his forehand to his backhand and put the puck around Kohler and into the open net to give Norfolk a 3-2 lead. Manchester tied the game with a goal from Nic Pierog. Pierog skated into the Norfolk end after a turnover and shot the puck from between the circles and beat Reichenbach over the blocker to tie the game at three. Manchester would get the deciding goal from Michael Dohtery at 12:30 of third period. Matt Marcinew played the puck to Eric Schurhamer to skated into the right circle. Schurhamer played the puck to the center of the ice where Dohtery knocked the puck in behind Reichenbach to give Manchester a 4-3 lead. Ty Reichenbach made 29 saves on 33 shots and takes the loss for Norfolk, while Cole Kohler made 24 saves on 27 shots and gets his first win of the year for Manchester. Wednesday, December 19, vs. Wheeling, 7:00 p.m.
Friday, December 21, vs. Wheeling, 7:00 p.m.
Saturday, December 22, vs. Wheeling, 7:00 p.m. - Hockey & Holly! Coming Soon: Pink in the Rink presented by Cavalier Auto Group, take place on Saturday, January 19 against Jacksonville. The game will be played on pink ice and pink jerseys. Wear your pink as raise awareness for breast cancer prevention and research.